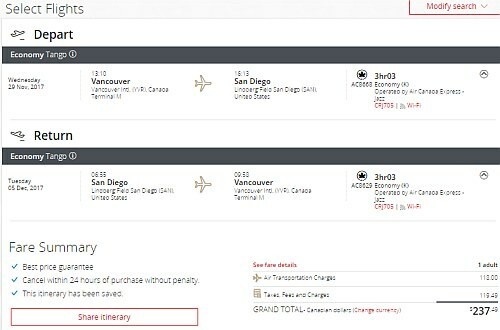 Air Canada has dropped the price of some November and December flights from Vancouver to San Diego, California down to $237 CAD roundtrip including taxes. 3. Select your flights and click through to the Air Canada website. Use the dates you found on Google Flights above. 3. On Priceline, the price will show up as $165 USD roundtrip including taxes (for the cheapest flights). Priceline is *always* in $USD. This will work out to $213 CAD roundtrip when booked using a Canadian credit card, and including the typical credit card foreign exchange fee. vancouver, yvr, flight deals, california, air canada, united states, north america, san diego and san. 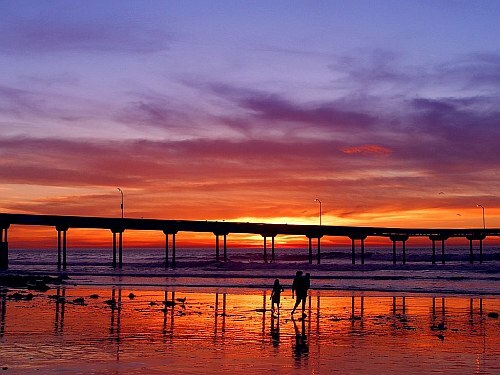 2 Responses to "Vancouver to San Diego, California - $213 to $237 CAD roundtrip including taxes | non-stop flights"
Just back from our Cancun vacation booked through Chris Myden YVR . Great price and great vacation. Last minute booking. Thanks for sharing, Chris. We'll do it again, soon. No problem Susan, I'm glad you had a great time!